The second day of spring probably isn’t the best time to start talking about comfort food. Creamed spinach fits squarely in this realm: on the holiday table, at Sunday supper, down south, nudged up against fried stuff. And if it weren’t for the several pounds of spinach I have in my fridge, I probably wouldn’t have thought to make it myself. Spinach has such easy appeal, it was my first favorite dark green. It’s a mild but meaty, clean slate for all sorts of different treatments. I like it in stir fries, curries, and saag paneer; stirred into lentil soup, stuffed into an omelet, or even raw, in a salad, though spinach salads seem to be waning in popularity nowadays. Enriching it with something creamy, as it is here, is just one way to showcase its charm. But I’m going to sidestep the problem of it not being comfort food season and argue that this is creamed spinach made dainty. This is creamed spinach for a luncheon, where it’s the main draw rather than the side dish. And after all, spinach is one of those items that we’ll find at the farmers’ market in the next several weeks, so I’m not entirely off base. I’ve seen creamed spinach dishes at restaurant where it looks more like spinached cream—sad, shredded leaves swimming in a pale green bath. This isn’t like that. Here it’s a light, garlic infused coating—made from béchamel, not heavy cream—on tender leaves and finished with a pop of heat. The hard-boiled eggs were a midnight-hour twist, but I like funk and chew they bring to the plate. 1. Blanch, steam, or sauté the spinach: To blanch, add the spinach to a pot of boiling water until just wilted, 15 to 25 seconds. To steam, bring an inch of water to boil in a saucepan, lower in a steaming insert, add the spinach, cover, and cook until wilted, about 2 minutes. To sauté, heat a splash of oil in a sauté pan and add the just cleaned—still wet—spinach to it and cook, tossing with tongs, until wilted, about 2 minutes. Transfer the cooked spinach to a colander to drain, then when it’s cool enough to handle, use your hands to gently squeeze out excess liquid. This step can easily be done up to 2 days in advance, just store the cooked greens in an airtight container in the refrigerator. 2. 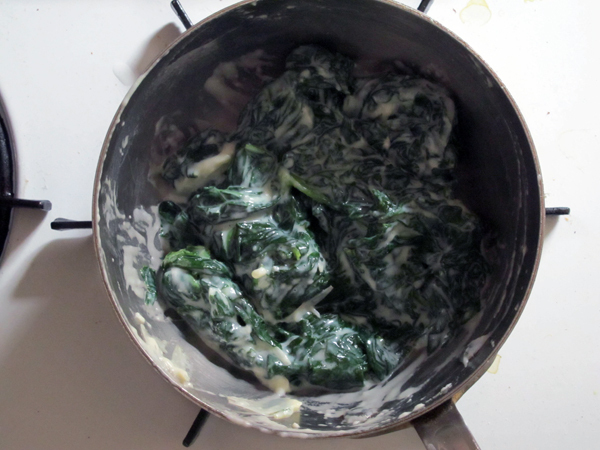 Prepare the creamed spinach: Heat the oil in a saucepan over low heat. Add the garlic and cook until fragrant and softened, being careful not to let it brown, about 2 minutes. Sprinkle in the flour and cook, whisking constantly, for a minute until you have a blond roux, which will take 1 or 2 minutes (it will just begin to smell nutty). Gradually whisk in the milk and increase the heat to medium high. Let cook until thickened to the consistency of glue. Lower the heat and stir in the salt, nutmeg, and cayenne. Stir in the cooked spinach and use a fork to break it up so that all the leaves are well coated. 3. Meanwhile toast your bread and crumble your hard-boiled eggs. 4. 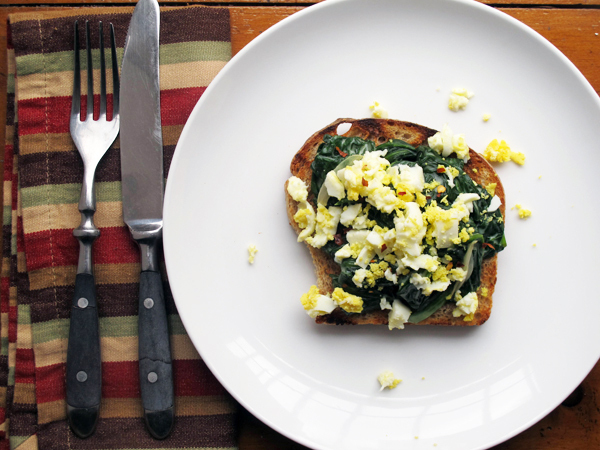 To serve, divide the spinach among the toasts, followed by the hard-boiled eggs. Garnish with a pinch of red pepper flakes if you’d like a bit more heat. * To hard-boil eggs, cover eggs with cold water in a small saucepan. Place over high heat. When the water comes to a rolling boil, put a lid on the pan, remove it from the heat, and let stand for 11 minutes. Immediately transfer the eggs to an ice bath until completely cooled. I find that letting them sit in the cold water for 15 to 20 minutes, or more, makes them easier to peel. Thanks for this – I literally just bought a ton of spinach and wasn’t sure what to do with it, and this looks delicious! This looks soooo goooood. I’m going to try it!!!! !